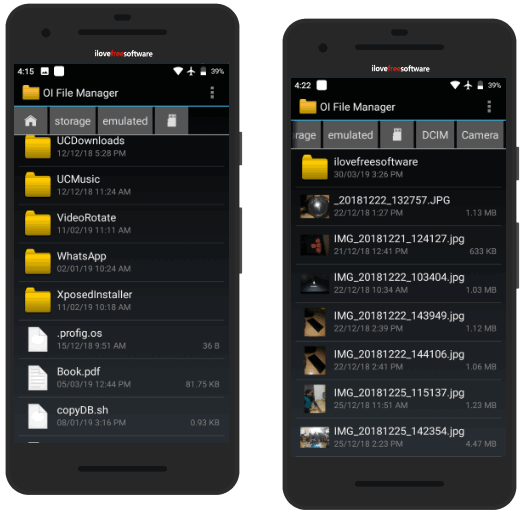 Here are 3 free open source file manager Android apps. These apps help you access items or files and folders stored in your internal storage as well as external storage (memory card) and manage them. You can use all those basic features like cut, copy, delete, rename a file or folder, create a new file, folder, sort files, search for a particular file, etc. Other than that, these Android apps have some unique features also. You can use advanced search with regular expression, use different themes, root explorer to access files stored in root directory of your phone, etc. Though the built-in file manager of Android phones is good enough to use, those who are looking for open source file manager apps for Android, this list is handy. Do note all these open source Android file managers need access to media, files, and photos on your device to work, which is obvious. Let’s check these free open source file manager Android apps one by one. 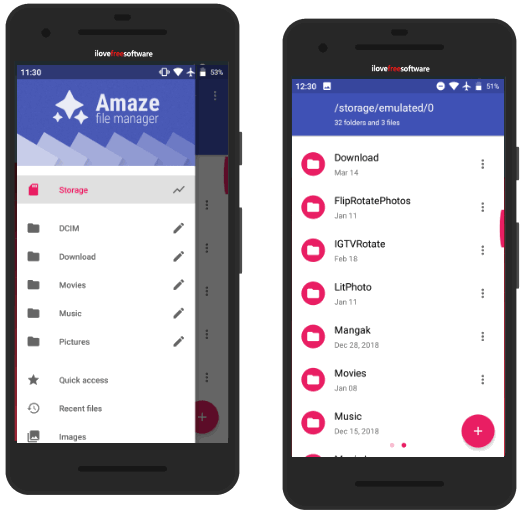 If you are looking for a feature rich open source file manager Android app, then Amaze File Manager is a good choice. The best part is its interface is ad-free. So, there won’t be any distraction to access items. It comes with material design interface and four themes are available to choose from. You can use material dark, material light, Black, and daytime times. There are Movies, Pictures, Music, and Download folders are also available to use. Apart from that, it lets you browser other categories like Images, Videos, Audio, Documents, APKs, etc., to quickly access the associated files. A search box is also there. If finding files using categories and folders is a bit difficult for you, then Search box can be used. And if normal search is not enough, you can also enable advanced search with Regular Expression, which is a unique feature not present in many open source file manager Android apps. You can also enable Root Explorer feature to access cache, root, system, storage, and other root folders . The features to encrypt files and folders and extract zip files are also there, which I like a lot. Apart from that, you can sort files and folders by size, type, and last modified. Grid view and list view modes are available to view files. The app is in beta mode but it works very well. Dir – File Manager (Homepage) comes with a simpler interface where exploring the different folders and accessing the files is very easy. It bookmarks some folders like Camera, Movies, DCIM, Music, etc., automatically. You can bookmark more folders and all such folders can be accessed using the Bookmarks section. You can select files and/or folders and then use options like cut, copy, compress, and delete. File/folder details can also be viewed separately. Apart from that, there are features like create a folder, search for a file, sort files by size, last modified, or name, sort files in ascending order, display hidden files, change theme to grayscale, dark, or default. 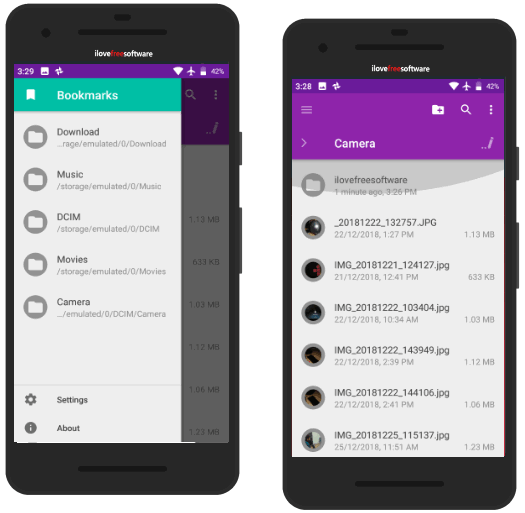 This open source file manager Android app doesn’t bring advance features, but those who need a simple file explorer, this app is handy to try. OI File Manager (Homepage) provides ad-free interface. It is also a simple open source file manager Android app which provides a basic interface. Still, the features are good. Like Dir – File Manager, it also lets you bookmark a file or folder. You can also view details, crop a photo, and use other basic features like send a file, rename, create folders, delete files and folders, compress files and folders, etc. It doesn’t come with Search option which you might not like. There are no extra features. Just a very basic open source file manager Android app that you may try. Here I close this list which has free open source file manager Android apps. Among these open source file explorer Android apps, the first one is my favorite. It is so because it has a lot of features and also comes with root explorer feature. Try these apps and if you know about some other free open source file manager apps for Android, you may share it using Comments section.